If Your Doctor Cannot Answer These 4 Questions, Don't Vaccinate! In all my years of researching vaccines, there is one thing that has always fascinated me--why do parents not question their doctors more about the benefits vs. risks of vaccinations? Common sense dictates that a parent should be inclined to inquire about a medication being injected into their child and its associated long-term risks if any. After all, even the medical community admits that every medication carries risks. Sadly, only a very small percentage of the population has the foresight to approach their doctor with inquiries related to risk before deciding to vaccinate. I am striving to change that percentage. Since many vaccine advocates find these to be contentious and lengthy areas of debate, your doctor will likely not be able to address these topics in a short visit (or perhaps even in a long visit). So focus on well documented and relatively simple areas of discussion which your doctor should be well aware of. If your doctor is not well-versed on these basic areas of vaccine research and education, it may be time to fine another doctor if you really are intent on vaccinating. "Do you know if any of the chemicals or preservatives inside the vaccine will accumulate in my child's body?" The pharmacokinetic properties of drugs which study the bodily absorption, distribution, metabolism and excretion of ingredients, are never studied for vaccines. This means a vaccine manufacturer or doctor can never know with any conclusive evidence if the chemicals or preservatives inside vaccines will accumulate (for any known period of time) in the body after a vaccine injection. You can check any vaccine insert for yourself to verify that these properties ARE NOT STUDIED. The reason they are not studied is because there would be conclusive evidence for a lack of metabolized heavy metals which are present in every vaccine. It would show how these toxins can accumulate inside the body and the brain and consequently demonstrate a serious health threat to vaccine recipients. "I read that thimerosal and mercury derivatives were banned 15 years ago by the FDA. Are they no longer in the current influenza vaccines then? Was there ever any conclusive evidence that thimerosal caused any harm?" Most doctors have now been trained to answer "NO" to this question. This is a misinformed and false response. The truth is, although the FDA gave a two year deadline to remove thimerosal from vaccines after they were banned in 1997, they kept appearing in vaccine formulations and the FDA did nothing about it. If the doctor refutes your assertion that thimerosal in vaccines was linked to disease, direct them to one of many research studies on the subject. Most vaccines prepared for the 2009 Flu Pandemic Hoax, 8 out of 10 H1N1 vaccines had thimerosal. Polio paralysis is a perfect example (among many others) to demonstrate the debilitating cause and effect of vaccination. Outbreaks of polio after 1950 were demonstrably caused by intensified diphtheria and whooping cough vaccination, tonsillectomies, other injections (painkillers) and a variety of traumas. There is now evidence that polio paralysis has also been a very common yet discreetly hidden side effect associated with polio vaccines. 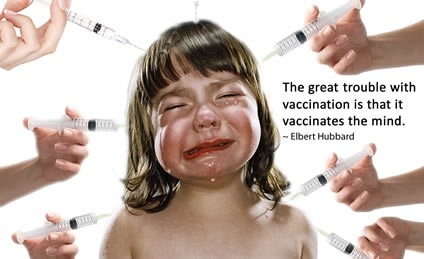 The chemicals in the vaccines depress our immune system; the virus present depresses immune function, and the foreign DNA/RNA from animal tissues depresses immunity. According to the United States' Food and Drug Administration, 1.5 million Americans were hospitalised in 1978 alone, as a consequence of pharmaceutical drugs administered to "cure" them. Can you imagine what that number is today? - Why Do Pharmaceutical Drugs Injure and Kill? The risks of vaccines in terms of their disease promoting capabilities far exceed any benefits claimed by the vaccine industry, period! "Has there ever been an INDEPENDENT scientific study which was randomized, double-blind and placebo-controlled which showed the long-term (20+ years or infant to adulthood) safety and effectiveness of vaccines?" In the history of independent and objective scientific inquiry, there has never been a study of this kind. Every single study which has attempted to examine the safety and effectiveness of vaccines has been short-term and subjectively biased while being conducted by academics directly or indirectly tied to the pharmaceutical industry. I have examined hundreds of these studies and have yet to find one independent and objective source claiming any conclusive evidence on long-term vaccine safety and effectiveness. If the doctor answers "YES" to this question, I would personally love to see that study and its funding source. There are many other investigative questions you can ask, but it is doubtful that any doctor will have the answer to even one of the above questions, so you really don't need to pursue it any further. These are perhaps some of the most relevant questions to approach mainstream medicine with regarding vaccines. Even if there were a doctor who could answer all four of these questions correctly, would you still want to proceed with vaccination? This page contains a single entry by sal published on April 2, 2012 12:58 PM. ANH Feature: Medical mavericks and heart disease was the previous entry in this blog. Stealth GMOs Rapidly Consuming Global Food Supply is the next entry in this blog.